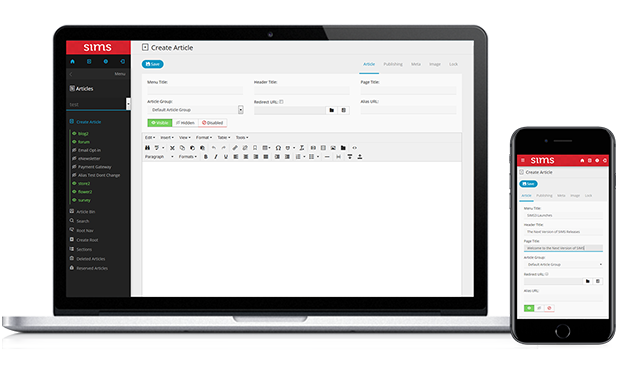 Content Management System - Sencia Canada Ltd. Your website needs to be dynamic and fresh. That shouldn’t have to come at a high cost to you. There’s no need to pay higher development costs by outsourcing or hiring additional staff to maintain your website. Take control of your website with SIMS' simple editing tools that are available wherever you have an internet connection and a web browser. See how we can help transform your online presence. It all starts with a conversation. Communication is the key to building a website that is engaging to your customers, responsive to your needs, and flexible for future updates. Our project manager will assess your requirements and offer the best possible solution to meet your needs and budget. A website isn’t much without an inviting, engaging, and intuitive design to get your visitors’ attention and keep it. Our talented designers have a passion for the creative arts and strive to build the best possible experience that meshes with your organization’s branding and identity. SIMS is a powerful platform that can be extended to fit virtually any requirement you may have. Articles, blogs, event calendars, community interactions, e-commerce, property and automotive listings—there’s not much we haven't built or can't build. SIMS can also be integrated with our other products such as Informetica and Sencia Track. We set ourselves apart with our incredible support team. Whether you need training on managing your content, setting up email accounts on your smartphone, or need guidance on Search Engine Optimization techniques, our staff can offer the assistance you need. We’re never “too busy” or “hard to get a hold of.” Our clients are our priority. SIMS offers a number of optional modules that you can purchase to further enhance your website's capabilities. The eCommerce module enables businesses to sell products and services online easily and efficiently. This shopping cart add-on offers the ability to keep track of inventory, while selling your products to a global market. iGallery is an optional module for SIMS that allows you to create an image gallery of thumbnails that, when clicked on, display an overlay of the image in a larger size. The Calendar module gives you the option to add, manage, and track upcoming events for your business. The Calendar module can be displayed in your choice of either Calendar View or List View (or a combination of both). The Live Stats module allows you to view hits, visits and other valuable information regarding your website's traffic.